Dice eggplant and transfer to a bowl. Add salt and mix to coat. Leave for approx. 60 min. to extract excess water and bitter compounds. In the meantime, dice celery stalks and tomatoes. Finely chop onions and garlic. Chop basil and halve olives. Toast pine nuts in a small frying pan for approx. 3 min., or until fragrant, and set a side. Heat up half of the olive oil in a large pan with a lid. Sauté onions and garlic for approx. 1 min. on medium-high heat, or until translucent. Add celery and sugar and sauté for approx. 2 more min., then add tomatoes, olives, and capers. Reduce heat, cover with lid, and leave to simmer for approx. 15 min. Rinse eggplant and pat dry to get rid of any excess water. Heat up the remaining olive oil in a large pan and fry the eggplant for approx. 3 - 4 min. over high heat. Transfer eggplant to the other pan and stir to combine with the other vegetables. Add red wine vinegar and let it simmer for approx. 10 min. 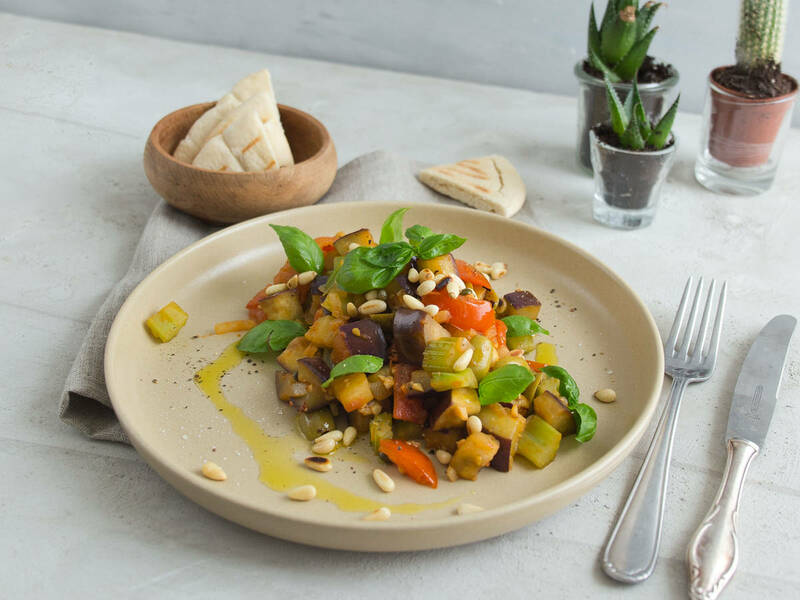 Season with salt and pepper and serve with freshly chopped basil, toasted pine nuts, and olives. Enjoy!